Greetings from Taiwan! I came here last week to give a talk about "C'Dent, the Acmeism and Everyone" at the 2010 OSDC.tw. It has been a wonderful time of reconnecting with old friends, making new friends, solidifying old projects and learning new things about computers, society and living. I feel more alive than I have in a long time. So alive, that I actually feel compelled to blog about it. Here's the rub... I haven't blogged at all since the last OSDC I attended in Paris, October 2009. A lot of blog worthy stuff has happened since then. I've been tempted to blog about this stuff, but when my fingers get near the keyboard, I realize that I really don't like blogging at all. Blogging is about having to make up a cohesive story about something interesting to you, and mark that story in a point in time. Tweeting runs in the opposite direction... a couple words about what's on tv. Wikis are closer to what I usually want; write a new addition or revision to a concept that I write about all the time. But wikis have problems in conveying exactly what it is on my mind (about this old subject) at this new point in time. I've decided that this will be my last traditional blog post ever. The trip to Taiwan has redoubled my desire to write to the world about many many things, and very often. But you'll no longer find them in this crappy blog. I'll keep this crappy blog somewhere for posterity but everything new will be in a system that supports my ideals. I have to point out a piece of delicious irony here... When I logged into Blogger to write this final post, I saw this message saying that they were completely dropping their FTP blog publishing from existence on May 1st, 2010. This is the technique that my (old, crappy) blog uses. It looks like picked the perfect time to quit blogging! I have so much to say to you, dear world, about so many things. I won't do it all here in this final post. I will do it later today in my new xlog (I just can't say the "B" word again). My Parisian host for http://osdc.fr loves to run and so do I. 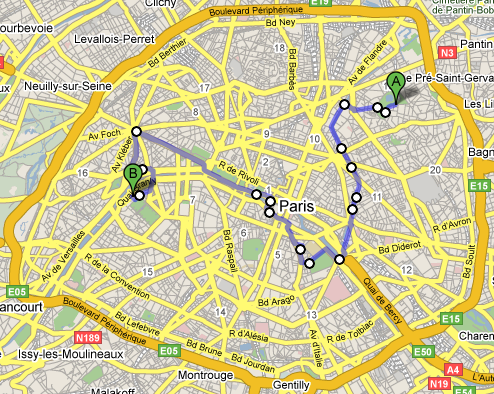 Today he took me on a great tour of Paris by foot. We ran past lots of historic places including the finish line of the Tour de France and we ended up under the Eiffel Tower. At that point we were 10 miles in and I was much too tired to run back home so we took the subway. I got on the plane to London via Dallas yesterday. It was running a bit late so I was worried about making my connection. It turns out, there was absolutely nothing to worry about. My London flight got canceled. No rush. They put me up in the DFW Grand Hyatt. Nice place for being stuck in the middle of nowhere. (Sorry TX, but it's true.) I really only had one problem left to solve. Who would rub lotion on my new back tattoo? I put some lotion on a towel, but that ended rubbing it off as quick as it got on. So I used a smaller cloth but had no way to reach the middle of my back. You can guess the rest, right? 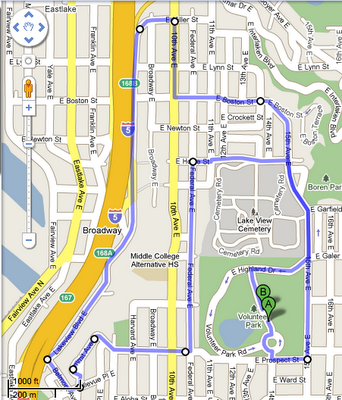 I was playing around with Google Maps this afternoon, looking for a run just over 10 miles. I found this beautiful half marathon distance route. I decided to run it right away, since it was such a beautiful day. It ended up being a perfect tour of scenic Seattle. 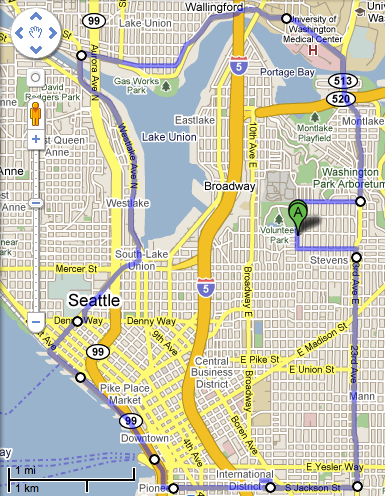 It starts and ends at Volunteer Park and goes around all of downtown and Lake Union. 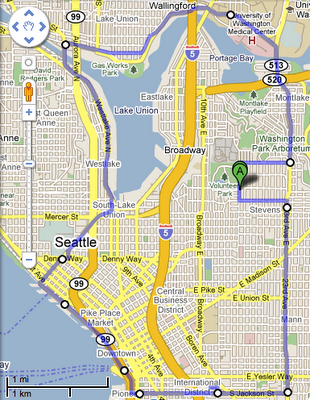 It goes through the Central District, the International District, all along the downtown waterfront, up to the Space Needle, over the Fremont Bridge, through Wallingford along the ship canal, and finally back over the Montlake bridge and up to Capitol Hill. Lovely! This one has been in the works for a long time now. Round one came together yesterday. Just need to get some shading/color next month. At the start of this month I was laid off by my employer of the last 5+ years, Socialtext. I was Socialtext's first hire, presumably to gain my expertise from developing the open source wiki, Kwiki. Since then, Socialtext has grown to employ as many as 50 people and has become the defacto leader in enterprise wiki software. They have branched out into other social software directions, and Kwiki, sadly, has all but died. Many of the other people hired by Socialtext were leaders in open software. Socialtext, much to my delight, fully embraced open source, and actually opened all of their wiki source code several years ago. At the beginning of this year, Socialtext moved all of their code to GitHub, making it even more publicly accessible. Last autumn there was talk at work of closing the open repositories. My thought at the time was that if they did, someone should fork all the open code. That's just the right thing to do, since the point of open source code is to keep it open for as long as it is relevant. At that point, I bought the domain name exoticslate.org. This was in keeping with the tradition of our developers making anagrams from the word SOCIALTEXT. We had made up over 50, iirc, including OX IS CATTLE, TOXIC TALES and TEXT IS COAL. "Exotic Slate" (although having an extra 'e') is a fantasic representation of Socialtext's rich and elaborate wiki product. A couple weeks ago I asked Socialtext if I could take Wikiwyg, their richtext editor component (which I had been working on for years), and revive it as a general, open source solution. They graciously agreed. I'm currently in Oslo at the Nordic Perl Workshop with Larry Wall and other old and new friends. Yesterday, at the workshop hackathon, I went to pull the Wikiwyg code out of Socialtext's main repository on GitHub, only to find the the repository was no longer open! Once I confirmed that it was in fact, closed off, I knew what the right thing to do was. I'm not sure what will become of Exotic Slate. That's the exciting thing about open projects... they take on a life of their own. I hope that people will join me on irc.freenode.net/#exoticslate to take this journey forward.